This image of the Challenger Deep in the Mariana Trench, the deepest spot on Earth, was made using sound waves bounched off the sea floor. Darker blues represent deeper spots. In 2010, the Challenger Deep was pegged at 36,070 feet (10,994 m), as measured with sounds pulses sent through the ocean during a 2010 survey by the National Oceanic and Atmospheric Administration (NOAA). In 2012, film director and deep-sea explorer James Cameron descended to the bottom of Challenger Deep, briefly reaching 35,756 feet (10,898 m) during the 2012 expedition. But he could have gone a little deeper. A high-resolution seafloor mapping survey published in 2014 by researchers from the University of New Hampshire said the Challenger Deep bottoms out at 36,037 feet (10,984 m). The ocean’s second-deepest place is also in the Mariana Trench. The Sirena Deep, which lies 124 miles (200 kilometers) to the east of Challenger Deep, is a bruising 35,462 feet deep (10,809 m). By comparison, Mount Everest stands at 29,026 feet (8,848 m) above sea level, meaning the deepest part of the Mariana Trench is 7,044 feet (2,147 m) deeper than Everest is tall. The Mariana Trench is 1,580 miles (2,542 kilometers) long — more than five times the length of the Grand Canyon. However, the narrow trench averages only 43 miles (69 km) wide. Because Guam is a U.S. territory and the 15 Northern Mariana Islands are a U.S. Commonwealth, the United States has jurisdiction over the Mariana Trench. In 2009, President George W. Bush established the Mariana Trench Marine National Monument, which created a protected marine reserve for the approximately 195,000 square miles (506,000 square km) of seafloor and waters surrounding the remote islands. It includes most of the Mariana Trench, 21 underwater volcanoes and areas around three islands. The Pacific crust, also called a tectonic plate, is about 180 million years old where it dives into the trench. The Philippine plate is younger and smaller than the Pacific plate. "At subduction zones, the cold, dense crust sinks back into the mantle and is destroyed," said Nicholas van der Elst, a seismologist at Columbia University’s Lamont Doherty Earth Observatory in Palisades, New York. As deep as the trench is, it is not the spot closest to the center of Earth. Because the planet bulges at the equator, the radius at the poles is about 16 miles (25 km) less than the radius at the equator. So, parts of the Arctic Ocean seabed are closer to the Earth’s center than the Challenger Deep. The crushing water pressure on the floor of the trench is more than 8 tons per square inch (703 kilograms per square meter). This is more than 1,000 times the pressure felt at sea level, or the equivalent of having 50 jumbo jets piled on top of a person. The Mariana Trench is located in the western Pacific Ocean. A chain of volcanoes that rise above the ocean waves to form the Mariana Islands mirrors the crescent-shaped arc of the Mariana Trench. Interspersed with the islands are many strange undersea volcanoes . For example, the Eifuku submarine volcano spews liquid carbon dioxide from hydrothermal vents similar to chimneys. The liquid coming out of these chimneys is 217 degrees Fahrenheit (103 degrees Celsius). At the Daikoku submarine volcano, scientists discovered a pool of molten sulfur 1,345 feet (410 m) below the ocean surface, something seen nowhere else on Earth. Recent scientific expeditions have discovered surprisingly diverse life in these harsh conditions. Animals living in the deepest parts of the Mariana Trench survive in complete darkness and extreme pressure, said Natasha Gallo, a doctoral student at the Scripps Institution of Oceanography who has been studying the video footage from Cameron’s 2012 expedition. Food in the Mariana Trench is extremely limited , because the deep gorge is far from land. Leaves, coconuts and trees rarely find their way into the bottom of the trench, Gallo said, and dead plankton sinking from the surface must drop thousands of feet to reach Challenger Deep. Instead, some microbes rely on chemicals, such as methane or sulfur, while other creatures gobble marine life lower on the food chain. The three most common organisms at the bottom of the Mariana Trench are xenophyophores, amphipods and small sea cucumbers (holothurians), Gallo said. The single-celled xenophyophores resemble giant amoebas, and they eat by surrounding and absorbing their food. Amphipods are shiny, shrimplike scavengers commonly found in deep-sea trenches. The holothurians may be a new species of bizarre, translucent sea cucumber. "These are some of the deepest holothurians ever observed, and they were relatively abundant," Gallo said. During Cameron’s 2012 expedition, scientists also spotted microbial mats in the Sirena Deep, the zone east of the Challenger Deep. These clumps of microbes feed on hydrogen and methane released by chemical reactions between seawater and rocks. However, a deceptively vulnerable-looking fish is not only right at home here, it’s also one of the region’s top predators. In 2017, scientists reported they had collected specimens of an unusual creature, dubbed the Mariana snailfish , which lives at a depth of about 26,200 feet (8,000 m). The snailfish’s small, pink and scaleless body hardly seems capable of surviving in such a punishing environment, but this fish is full of surprises, researchers reported in a new study. The animal appears to dominate in this ecosystem, going deeper than any other fish and exploiting the absence of competitors by gobbling up the plentiful invertebrate prey that inhabit the trench, the study authors wrote. Unfortunately, the deep ocean acts as a potential sink for discarded pollutants and litter. In a recent study, a research team led by Newcastle University shows that human-made chemicals that were banned in the 1970s are still lurking in the deepest parts of the ocean . While sampling amphipods (shrimp-like crustaceans) from the Mariana and Kermadec trenches, the researchers discovered extremely high levels of persistent organic pollutants (POPs) in the organisms’ fatty tissues. These included polychlorinated biphenyls (PCBs) and polybrominated diphenyl ethers (PBDEs), chemicals commonly used as electrical insulators and flame retardants, according to a study published in the journal Nature Ecology & Evolution. These POPs were released into the environment through industrial accidents and landfill leakages from the 1930s until the 1970s when they were finally banned. "We still think of the deep ocean as being this remote and pristine realm, safe from human impact, but our research shows that, sadly, this could not be further from the truth,” said lead author Alan Jamieson of Newcastle University in a press release. In fact, the amphipods in the study contained levels of contamination similar to that found in Suruga Bay, one of the most polluted industrial zones of the northwest Pacific. Since POPs cannot degrade naturally, they persist in the environment for decades, reaching the bottom of the ocean by way of contaminated plastic debris and dead animals. The pollutants are then carried from creature to creature through the ocean’s food chain, eventually resulting in chemical concentrations far higher than surface level pollutions. "The fact that we found such extraordinary levels of these pollutants in one of the most remote and inaccessible habitats on earth really brings home the long term, devastating impact that humankind is having on the planet," said Jamieson in the press release. The researchers say the next step will be to understand the consequences of this contamination and what it is doing to the ecosystem as a whole. In 1875, the trench was discovered by the HMS Challenger using recently invented sounding equipment during a global circumnavigation. In 1951, the trench was sounded again by HMS Challenger II. Challenger Deep was named after the two vessels. In 1960, a "deep boat" named Bathyscaphe Trieste reached the bottom of Challenger Deep. It was the first vessel to do so and was manned by U.S. Navy Lt. Don Walsh and Swiss scientist Jacques Piccard. In 1995, the Japanese unmanned submarine Kaiko gathered samples and useful data from the trench. In 2009, the United States sent a hybrid remotely operated vehicle, Nereus, to the floor of Challenger Deep. The vehicle remained on the seabed for nearly 10 hours. In 2012, Cameron manned the Deepsea Challenger and reached the seabed but was unable to capture any photos due to a hydraulic fluid leak. The submersible was later donated to the Woods Hole Oceanographic Institution . Email Becky Oskin or follow her @beckyoskin . Follow us @livescience , Facebook & Google+ . Becky Oskin covers Earth science, climate change and space, as well as general science topics. Becky was a science reporter at Live Science and The Pasadena Star-News; she has freelanced for New Scientist and the American Institute of Physics. She earned a master’s degree in geology from Caltech, a bachelor’s degree from Washington State University, and a graduate certificate in science writing from the University of California, Santa Cruz. So, if you want to calculate how many miles are 10994 meters you can use this simple rule. We have created this website to answer all this questions about currency and units conversions (in this case, convert 10994 m to mis). If you find this information useful, you can show your love on the social networks or link to us from your site. Thank you for your support and for sharing convertnation.com! An ocean mapping expedition has found four sea floor ‘bridges’ across the deepest place on Earth, the 1,500-mile long, 6.8 mile deep Mariana Trench in the western Pacific Ocean near Guam. Some of the ‘sea mounts’ are 2,500 metres tall, and form bridges across the trench as one tectonic plate is pulled under another. Using a multibeam echo sounder, scientists also measured Earth’s deepest point, Challenger Deep more precisely than ever before. Mapping the entire Mariana Trench with shipboard scanners from August until October 2010, the researchers discovered four bridges spanning the trench. The bridges rise as high as 2,500 meters above its floor. ‘That got me excited,’ he says. Because the ocean’s crust cools as it ages, ‘The Pacific crust is much, much older, so it’s diving underneath the Philippine plate,’ Gardner says. 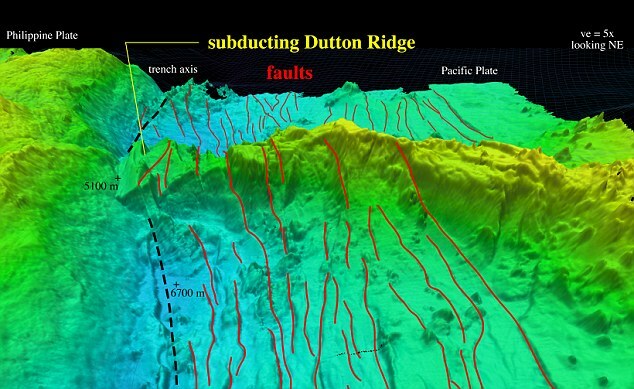 As seamounts on the Pacific plate are pulled beneath the Philippine plate – ‘subduction’ – they are compacted against the wall of the trench, forming these ridges. March 2011 earthquake in Japan. ‘It’s incredibly complex geology. 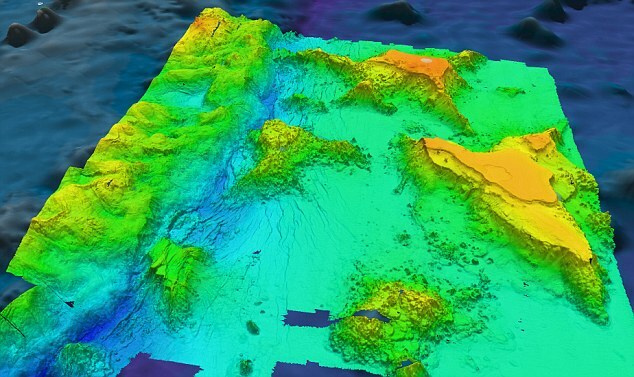 These seamounts are getting jammed up against the plate,’ Gardner says. The expedition also yielded the most precise measurement yet of Challenger Deep, the trench’s (and the Earth’s) deepest point, finding it to be 10,994 meters deep, plus or minus 40 meters. Calculated from thousands of depth soundings as well as detailed analysis of how the how the water can alter the echo sounding signals, the new measurement is similar to other claims of the Challenger Deep’s depth, some of which are deeper. ‘When you’re dealing with something that’s 11 kilometers deep, you have to deal with inherent uncertainties in the system,’ says Gardner, noting that Challenger Deep is deeper than Mount Everest is high. Hydrographers and ocean mappers such as Armstrong and Gardner describe the process of mapping an area as like ‘mowing the lawn,’ making overlapping tracks over the area in question. Apple’s new iPad is blazingly fast, gorgeous to look at, and quite simply the best tablet out there – and for a lot of people, probably the best computer out there. Apple’s new iPhone XS and XS Max go on sale on Friday – and the biggest handset Apple has ever made is also its best (and possibly unsurprisingly, its most expensive). Israeli beauty-tech firm Pollogen has launched its Geneo Personal device, which stimulates oxygen from beneath the skin’s surface to give you a clearer, fresher face within minutes. Rather than cram in a plethora of new features, Apple’s latest update is about boosting stability, with improvements in everything from FaceID and battery life.